Oscar Wilde comes to Antibes! Come and see our intimate performance of his masterpiece “A Picture of Dorian Gray” at La Timonerie, November 8th & 9th, in aid of the children of Cambodia. Donations upwards of 20€ to include intermission drinks and canapés. I’ll write more before the two performance days.. Bon Chance et Merci Beaucoup Cote d’Azur, from the children and their families. John. 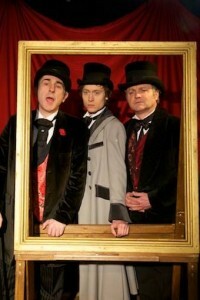 “I’m a Mougins resident who had the good fortune to see this production in Dublin earlier in the year. 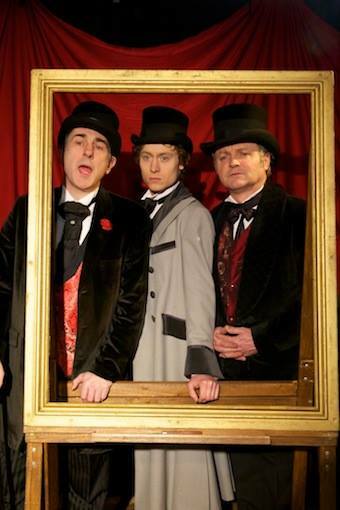 MJ Ford, Simon Coury and Michael Winder are extraordinarily talented actors, and the intimate scale of this show really brings Wilde’s language to the fore. A highly recommended evening, and for a great cause to boot”. Added November 8 2013 – Bon Chance Antibes. Tonight and tomorrow night. Love from all the children and their families. If you have opened this site for the first time, this is our Blog, usually once or twice a month. PLEASE look to the left and browse through the sections. If you feel you can help a little financially then look at the Donate and Donor sections and join us. Please. There are eleven photos in today’s Blog. 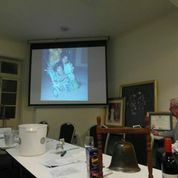 On Tuesday evening October 8 2013 (two days ago) The Rotary Club of Beaudesert held its weekly meeting in the Logan and Albert Hotel. 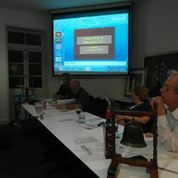 It was a special night – A Rotary Awareness Night. 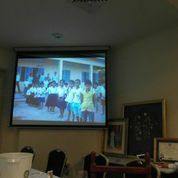 Three of us talked through all the things that Rotary does locally around this club and also Internationally. 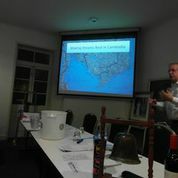 A number of local people came along to find out what “Rotary” is all about. Our Rotary Club raises money mostly through our two catering vans. We cook breakfasts, burgers, chips, steak- sandwiches etc and the following is a list of people and projects the Club has supported over the past 12 months. A snake catcher and his book. Beaudesert Hospital. Various child sporting endeavours (mostly travel). A motorized invalid scooter. School competitions. An Historical Society. A wheelchair. A number of local disasters – flood and fire. Supporting poorer children in the area. This year we have founded an ‘Interact Club” at Beaudesert High School An Interact Club is Rotary for students age 12 – 18. 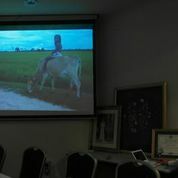 They are already actively fund raising for local charities as well as International ones. Three of these students will be joining seven members of The Beaudesert Club when they visit our Cambodian villages in January – just three months away! About two thirds all money raised by The Club goes towards local charities. 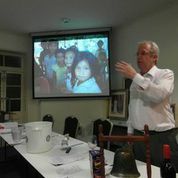 About one third goes internationally; within that third a lot of the money for Cambodia is raised specifically for Cambodia. eg. collection tins stating that all that particular money is for Cambodia. 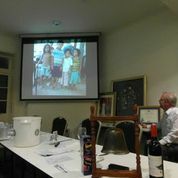 The Beaudesert Club gives to ROMAC which pays to bring children from poor countries who need serious and often complex facial surgery. 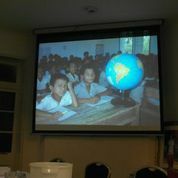 The Rotary Health Foundation (health issues in poorer countries). Goods going overseas needing shipping finance. Disaster Aid – this is mostly the Shelter Box large tents, cooking equipment, water purification etc sent to large scale international disasters. 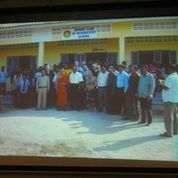 ..and to our Cambodian Schools projects. 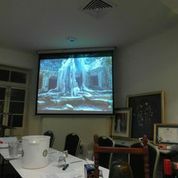 On Tuesday evening I showed and talked through one hundred of our photos. In today’s blog there are just 10 of those photos. ALL of them are already within this website along with full explanations. On November 8 and 9 this year there will be another show in Antibes for our schools. John. 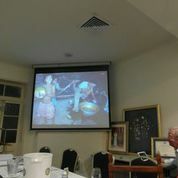 Mark McCabe, a fellow member of The Rotary Club took all the photos on the night. John.